The SWR is usually defined as a voltage ratio called the VSWR, for voltage standing wave ratio. For example, the VSWR value 1.2:1 denotes a maximum standing wave amplitude that is 1.2 times greater than the minimum standing wave value. It is also possible to define the SWR in terms of current, resulting in the ISWR, which has the same numerical value. The power standing wave ratio (PSWR) is defined as the square of the VSWR. The voltage component of a standing wave in a uniform transmission line consists of the forward wave (with amplitude Vf) superimposed on the reflected wave (with amplitude Vr). Γ = + 1: maximum positive reflection, when the line is open-circuited. ρ = | Γ | . As ρ, the magnitude of Γ, always falls in the range [0,1], the VSWR is always ≥ +1. The SWR can also be defined as the ratio of the maximum amplitude of the electric field strength to its minimum amplitude, i.e. Emax / Emin. This varies with x from a minimum of A(1 − ρ) to a maximum of A(1 + ρ), as we saw in the earlier, simplified discussion. A graph of Vmot against x, in the case when ρ = 0.5, is shown below. The maximum and minimum Vmot in a periods are Vmin and Vmax and are the values used to calculate the SWR. Standing wave ratio for a range of ρ. In this graph, A and k are set to unity. It is important to note that this graph does not show the instantaneous voltage profile along the transmission line. It only shows the maximum amplitude of the oscillation at each point. The instantaneous voltage is a function of both time and distance, so could only be shown fully by a three-dimensional or animated graph. The most common case for measuring and examining SWR is when installing and tuning transmitting antennas. When a transmitter is connected to an antenna by a feed line, the impedance of the antenna and feed line must match exactly for maximum energy transfer from the feed line to the antenna to be possible. The impedance of the antenna varies based on many factors including: the antenna’s natural resonance at the frequency being transmitted, the antenna’s height above the ground, and the size of the conductors used to construct the antenna. 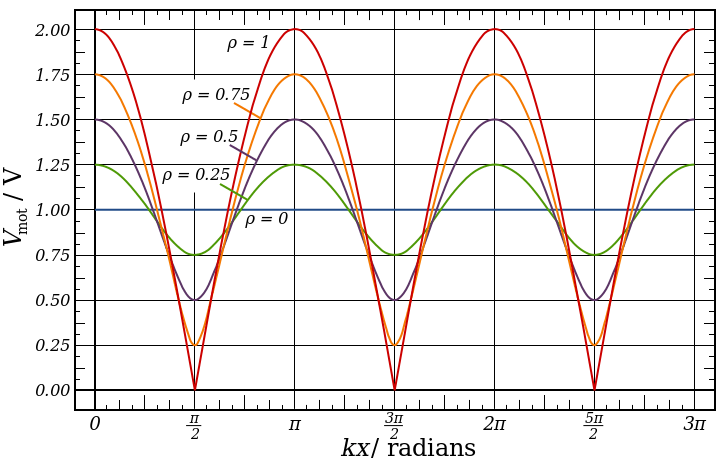 When an antenna and feedline do not have matching impedances, some of the electrical energy cannot be transferred from the feedline to the antenna. Energy not transferred to the antenna is reflected back towards the transmitter. It is the interaction of these reflected waves with forward waves which causes standing wave patterns. Reflected power has three main implications in radio transmitters: Radio Frequency (RF) energy losses increase, distortion on transmitter due to reflected power from load and damage to the transmitter can occur. Matching the impedance of the antenna to the impedance of the feed line is typically done using an antenna tuner. The tuner can be installed between the transmitter and the feed line, or between the feed line and the antenna. Both installation methods will allow the transmitter to operate at a low SWR, however if the tuner is installed at the transmitter, the feed line between the tuner and the antenna will still operate with a high SWR, causing additional RF energy to be lost through the feedline.